Having been first created in 1936 Go to the Head of the Class is likely one of the first commercial trivia games ever created. While not as popular as it once was there have been over 25 versions of Go to the Head of the Class made over the years. Despite there being so many different versions of the game, I had never played the game as a kid and I always thought it was too simplistic to try it as an adult. After finding the eighteenth version at a rummage sale for only $0.50 I decided to give the game a chance. Despite deserving credit for being one of the first trivia games, Go the the Head of the Class has not aged well. Place the board in the center of the table. Shuffle the luck and examination cards and place them on the corresponding spaces on the board. The players choose whether they are going to use the junior, intermediate, or senior section of the question booklet. One player will be chosen as the teacher who will read from the question booklet for every question but their own. Each player chooses a playing piece and rolls the dice to determine which desk they start their piece on. 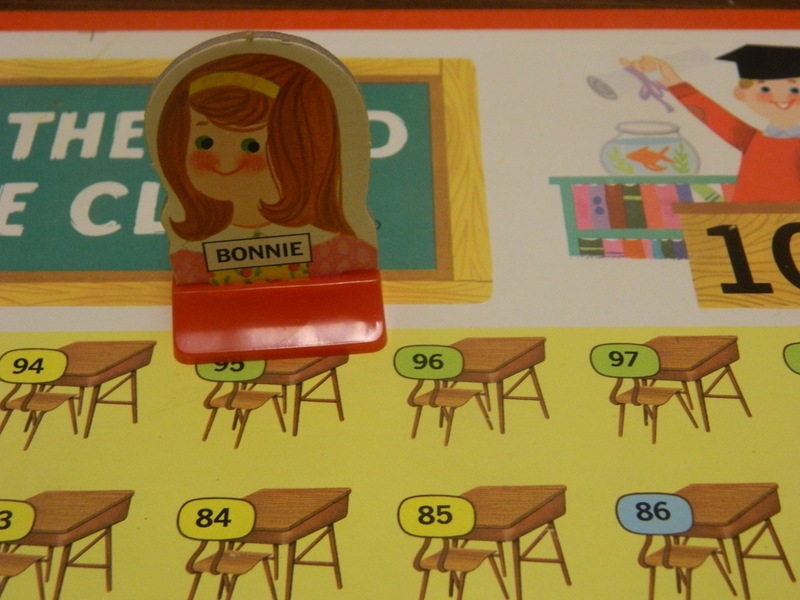 The player who starts on the lowest numbered desk gets to start the game. A player begins their turn by rolling the dice. 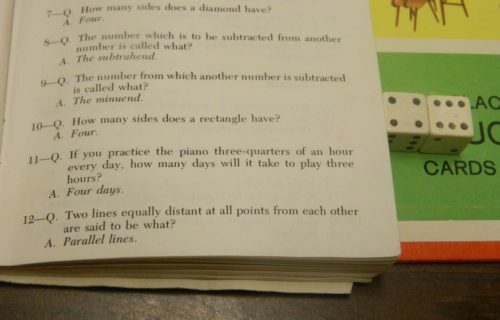 The teacher will ask the question on the current page with the same number as the number that was rolled. This player has rolled a ten so they will be asked the tenth question. 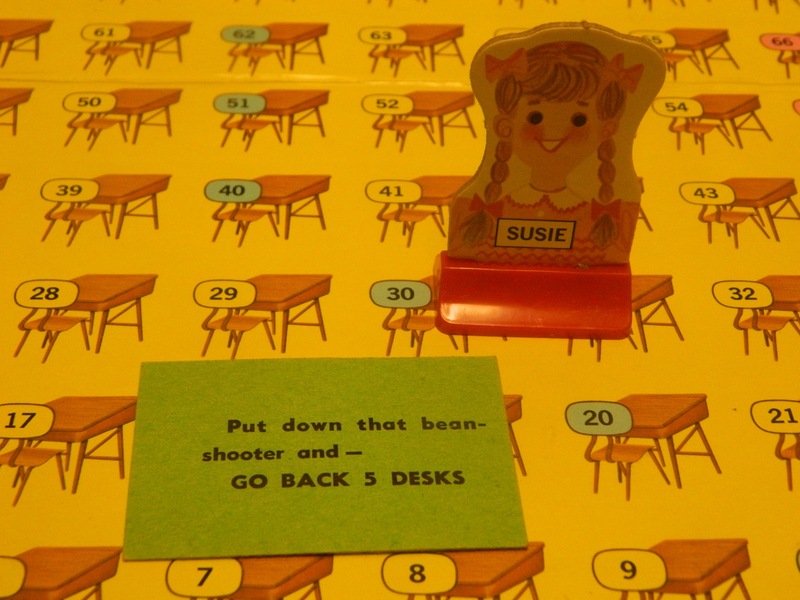 If the player answers the question correctly, they move forward six desks. 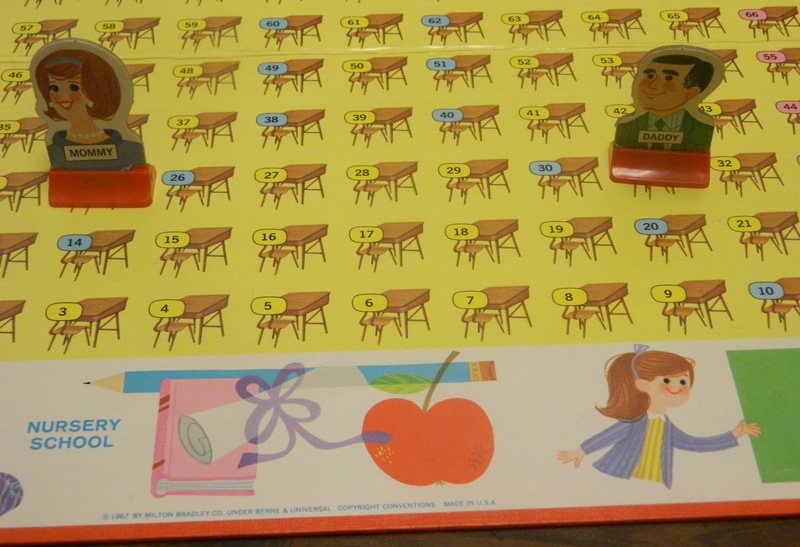 If the player answers incorrectly, they move back two desks. If a player rolled doubles, they instead will move forward or backwards the number that they rolled. This player has rolled doubles so they will either move forward or backwards twelve spaces depending on whether they get the question correct. If while moving a player lands on the same desk as another player they will move to the next unoccupied desk in the direction that the player is moving. If the mommy player would get their next question correct they will land on the same desk as daddy. The mommy player will then be able to move their piece to the next space. If a player helps another player in any way with their question, they will have to move their piece back three desks. If a player lands on a desk with a blue chair they draw the top luck card and follow the directions on the card. The card is then put on the bottom on the stack of cards. The Suzie player has landed on a blue desk so they draw the top luck card and do as it says. If a player lands on a desk with a red chair they will draw the top examination card. The player has to answer the question that corresponds to their difficulty level. The answers to the cards are in the question booklet. If the player answers correctly they move forward 12 desks. If they answer incorrectly they will move back 5 desks. The card is then put on the bottom of the stack. The player will have to answer the question corresponding to the level of questions they are answering in the game. 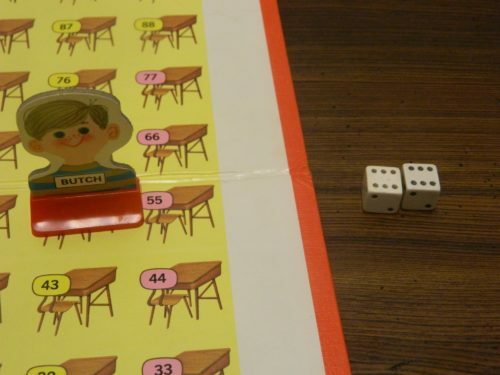 If a player is ever sent back to nursery school (moves behind desk one), on their next turn they will roll the dice and move to the corresponding desk. This will act as their turn and they don’t get to answer a question. 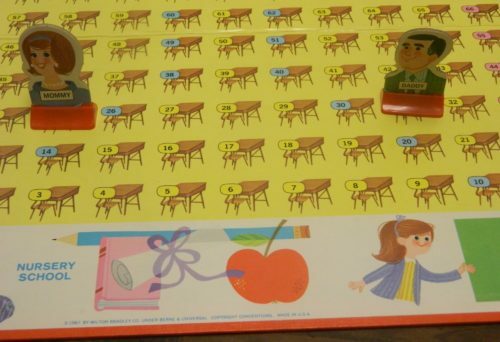 If while in nursery school a player is able to answer any question that was answered incorrectly by another player, the player moves their piece to desk twelve. 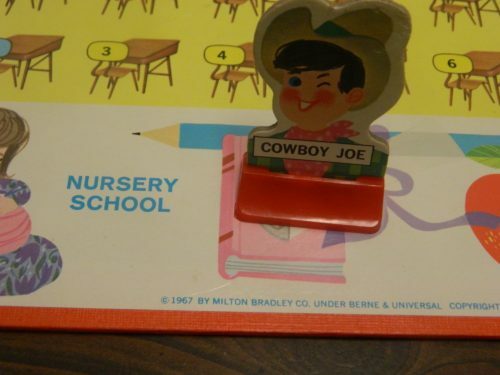 Cowboy Joe has been sent to the nursery school. When a player reaches the last five desks (green chairs) they will enter the end game. The game is played the same except that the player only moves forward one desk for each correct guess while moving back the same number of desks if they are wrong. This player has reached one of the final five desks so they will only move forward one desk for each correct answer. The first player to reach desk 100 wins the game. 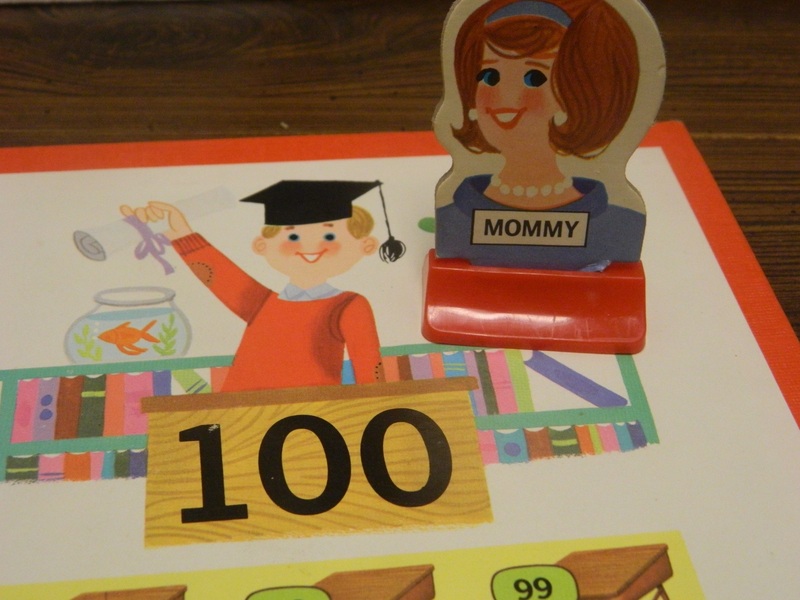 The mommy player has reached desk 100 and has won the game. So I would like to start by reiterating that I am basing this review on the 1975 eighteenth edition of the game. I would like to point out that this version of the game was released over 10 years before I was born so that probably has some impact on my thoughts of the game. 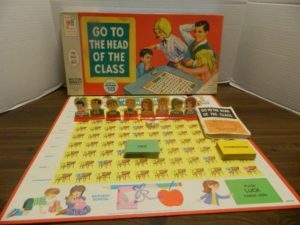 Go to the Head of the Class is one of those board games that released a new version every couple of years. While there are a couple newer versions the game is not as popular as it once was. While I haven’t consulted the very early or most recent versions of the game, I believe the game has remained mostly the same between all of the versions of the game except for possibly some minor rule tweaks. The main difference between all of the versions of the game are the question booklets. Since there are only minor differences between the games I am going to review Go to the Head of the Class based on just the eighteenth version of the game. If there is a major difference with the oldest versions or the newest versions of Go to the Head of the Class leave a comment below and let me know. Being a game meant for families I was expecting Go to the Head of the Class to be a pretty simple trivia game. Well that assumption was definitely not right. While I attribute quite a bit of the difficulty to the game being outdated, the question selection is pretty strange. I applaud the game for having three different difficulties but the difficulty is far from consistent. Some categories are more difficult than others but there are a lot of categories where some of the questions are really easy while others are really hard. This inconsistency in difficulty is a problem for every trivia game but it seems worse in Go to the Head of the Class than most trivia games. The problem with the inconsistent difficulty is that it adds quite a bit of luck to a trivia game that should have very little luck in it. Other than adding luck the difficulty makes Go to the Head of the Class last way too long. Since you lose spaces for incorrect guesses you are constantly going forward and backwards hoping that you go forward more often than you go backwards. The more recent versions of the game probably don’t have as big of problem with this but the older versions are a regular fight to slowly make progress. In a game that should only last around 30 minutes, it will take you at least 45 minutes to an hour and a half to finish a game. This makes the game drag on which hurts the game. This back and forth becomes an even bigger factor when you consider the doubles rules. While they don’t play a big role in the game, I don’t like the doubles rules. The problem with the doubles rules is that you will almost always lose when you roll doubles. If you roll two ones, twos or threes you will either gain less spaces for correct answers and/or lose more spaces for getting questions wrong. When you roll doubles with higher numbers you can gain or lose more spaces. While this is nice when you get the questions right, it really hurts when you get the question wrong. The main reason that I don’t like the doubles rules are that for a majority of situations you will be worse off because you rolled doubles. While they don’t come into play very often I also don’t like the idea of the “Category” categories. These pages of the question book give the players a topic and all of the players have to take turns listing off items that fit the topic until one player can’t list a new item. I actually like the change in pace but I don’t like that it disadvantages the player who gets one of these questions on their turn. They get no more benefit than another player and yet they have to give up one of their chances to answer a question by themselves. I think a lot of the problems with Go to the Head of the Class can be attributed to the fact that the game is outdated. I ended up playing the 1975 version of the game (18th edition) and you could tell that the game is outdated. The newer versions of the game should be better in this regard but this is a serious problem for the older versions. The main problem with the game being outdated is that it actually makes the game more difficult than it should be. This mostly comes from the questions being about things that either are no longer taught in school or are the type of things you might learn and then immediately forget. For example in the eighteenth version of the game there is a whole page of sailing questions. Unless you live in a coastal town, I really doubt anyone is taught about sailing in school. There are also a surprising amount of questions about composers (rarely covered in schools anymore). Then there are the questions about President’s middle names. I really want to know why anyone would bother remembering President’s middle names and then the game decides to throw in Harry S Truman who didn’t even have a middle name. While the game being outdated does add unnecessary difficulty to the questions, it does add some charm and humor at the same time. Someone who remembers the game from their childhood would probably have a lot of fond memories of the game. If you never played the game as a kid though this really won’t apply to you. Go to the Head of the Class feels like a game from another era for better and worse. I was surprised by how much our group laughed at how outdated at times Go to the Head of the Class was. The funniest moment of the game came from the question: “How many legs has a spider?” That is exactly how the question is printed in the question booklet and not my typo. Component wise the earlier Go to the Head of Class games are typical of Milton Bradley games from their era. 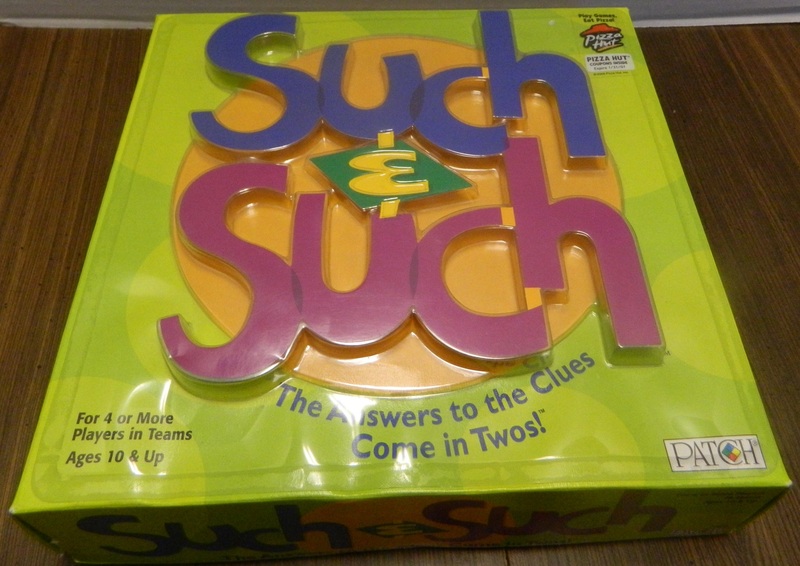 The game uses mostly cardboard pieces which are nothing special or terrible. It is kind of annoying that the cardboard pieces only have artwork on one side of the pieces. The major component in the game though is the question booklet as it is one of the few things that are different between all of the versions of the game. The eighteenth edition only has 781 questions so at least with the older versions you can go through a lot of the questions pretty quickly and will then be forced to repeat questions. Should You Buy Go to the Head of the Class? 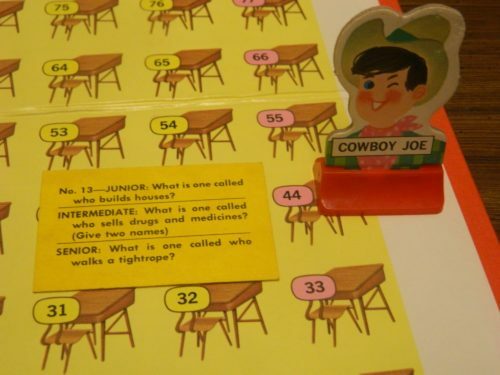 Being one of the first commercial trivia games you have to give Go to the Head of the Class credit for helping to create one of the most popular board game genres. At this point though Go to the Head of the Class is just another trivia game which only differs from other trivia games in the movement mechanics of the game. While it was original when it was first released, Go to the Head of the Class is outdated compared to today’s trivia games. This is most prevalent in the older versions of the game because the age makes the questions a lot more difficult than they should be. The newest versions shouldn’t be as outdated but they are just another trivia game. If you don’t love trivia games, Go to the Head of the Class will not be for you. If you only occasionally enjoy trivia games, you can find much better trivia games than Go to the Head of the Class. If you have nostalgia for the game though it may be worth picking up Go to the Head of the Class if you can get a good deal on it. If you want a real challenge you should look towards the older copies of the game but otherwise I would advise looking for one of the more recent versions of the game. I am trying to remember a game i played at the neighbor’s house. It may be Go to the head of the class. Were there questions about classic Authors? Sir Arthur Conan Doyle, Robert Lewis Stevenson, Mark Twain, and the like..? Between 1936 and 1986 there were 26 different editions of Go to the Head of the Class. With each version having different questions and topics (which changed based on what topics were popular when the game was released), I unfortunately can’t confirm or deny if there is a version that features questions about classic authors. Based on the version of the game that I played though, I could definitely see those being the type of questions asked in one or more versions of the game. I am sorry that I couldn’t be of more help. One of the earliest trivia games. The questions for the older versions of the game are outdated. Doesn't do anything different than any other trivia game.